In 2009, the Tallinn Philharmonic asked me if I’d write them a “Tallinn Mass” to celebrate their ascension to European Capital of Culture, in 2011. They wanted to juxtapose the conventional mass movements, in Latin, with ten new poems by their two leading poets, Doris Kareva and Jürgen Rooste – in Estonian. So poor was my knowledge of the country, I remember thinking that, as it was not so far from my semi-native Poland, the language must have some similarities. By the time I started to compose, ten poems had turned into nineteen and the possibly-familiar language had turned out to be from the beautiful but seemingly impenetrable Finno-Ugric family. I found myself working from two different translations (a general one and a word-for-word one – to make sure I didn’t make a big musical deal of articles and prepositions! ), a pitch and rhythmic transcription that I made from a recording of poets Doris and Jürgen reciting their words – and of course, the Estonian text. Why am I telling you all this when this version you’re about to hear is in English? Because I would like you to know just how deeply I immersed myself in the intensely beautiful verbal and folkloric sound-world of Estonia – to the point that I (quite disloyally) felt more Estonian than Polish or English! I even began to dream in this glacial, tricking, stream-like language. Now that I have spent a good deal of time in Tallinn, the Dance of Life friends I’ve made through this project have become like family, especially Heili Vaus-Tamm, whose idea this all was. This piece is made of two components: Tallinn Mass is a setting in Latin, with some important phrases reiterated in Estonian and English. The second element is Dance of Life, consisting of nineteen new poems by Doris Kareva and Jürgen Rooste, inspired by the famous 15th century painting by Bernt Notke, “Dance of Death”, in Tallinn’s St Nicholas Church. The poets have taken this idea and transported its characters to the 21st century, using their individual messages as a rich and dramatic framework to the Latin Mass movements – hence the piece is in six “Acts”. (Tallinn Mass is also available for performance, as a shorter work on its own, without the poems – for choirs without the soloists). All musical ideas are inspired by Estonian culture and folklore – original folk songs from as early as the 1930s appear, as does the constant presence of the Estonian psaltery the “kannel” (this has been written so it can be played on the harp if a kannel isn’t available). I have also used some of the church bell patterns of Tallinn’s churches to open and close the piece (it was the bells in my earlier Westminster Mass (1997) which brought Heili Vaus-Tamm of the Tallinn Philharmonic to me, for this project). I have used two choirs, one of upper voices and the other of mixed voices to create a sense of space, a stereophonic effect and to represent the magnificent range of choral singing in Estonia. 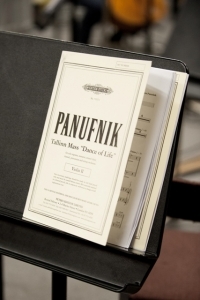 The Soprano soloist takes the role of LIFE/Elu and the Narrator plays the other various characters. LIFE’s role is that of appraiser, observer and comforter – she is like Mother Earth and Angel Gabriel, combined. We begin with 1. PREACHER/Jutleja introducing us to the piece and warning that LIFE/Elu will be exposing any fraud. This is followed by the choir repenting for wasted lives with “Kyrie Eleison” (“Lord, have mercy”), imitating the different church bells of Tallinn, summoning us all to Mass. This music is dominated by the unique dotted, three-pitch Oleviste Kirik (St Olaf’s Church) peal (which continues to influence the rest of the piece) and also includes the Kaarli Kirik (Charles’) and Pühavaimu Kirik (Holy Spirit) Churches. Their voices take a bell-like quality, in clarity of sound and attack. The 2. PREACHER/Jutleja returns to extol the beauties of Tallinn and introduces 3. LIFE/Elu who sings about her hometown with great pride and patriotism. She then invites you all to the Dance of Life, saying that it will be a wild and frenzied affair, everyone from the youngest to the oldest will be invited – even the poorest, including the 4. BEGGAR/Kerjus. He sings part of a folk song Joodiku Kojukutse (“The Drunkard is called back home”, from Hargla, 1957), which enhances his regret as he tells us his life story, saying on one hand he has complete freedom but on the other he is still needy – all over increasingly sad harmonies. 5. LIFE/Elu reassures him with a gentle rocking accompaniment – but also berates him for accepting his fate so passively, telling him he must find strength, passion and devotion to join in the Dance of Life. In creeps the 6. SPY/Nuhk accompanied by sliding strings in queasy chords, with little tremolo shivers on the kannel. 7. LIFE/Elu responds with a mixture of caution and disdain, her rhythms are more sedate and reserved. This leads to the choir continuing with their pleas for mercy, in the remaining Kyrie and we end this act with the fading church bells of Tallinn. This movement begins with the 8. MAYOR/Linnapea. Doris Kareva told me that she envisaged a very rhythmic and mechanical delivery to evoke the aura of industrial power – she likened the mayor to the brutal puppet owner (and hence, string-puller) from the original Pinocchio book, Carrabas Barrabas. The folk song Kokku, koorekene! (“Thicken precious cream”, from Tori, 1961), which is more chanted than sung, seemed a perfect background – I liked especially the comparison of the greedy mayor consolidating his assets and ego to a background of rich, unctuous thickening cream… The Gloria responds to his self-congratulation with the resplendent herding shouts Helletused and hoots Huiked, originally used by herders from Kolga Jaani (1937) and Suure-Jaani (1961). 9. LIFE/Elu teases him about his “powerful” nose, extending the Pinocchio analogy. She tells him that only God decides which music should play and that the real power belongs to Life. The choir sings the rest of the Gloria, in praise of Life with God. We then meet the 10. BANKER/Pankur. Beleaguered and stressed, he has every luxury available to him but no time for Life or living. A nervous tremolando violin hints at his instability, as the orchestral bells seem to toll his life away. 11. LIFE/Elu’s harmonies darken as she sings of the evil temptations that the spoils of too much work can bring. Then she soothes him, as she did the BEGGAR/Kerjus, telling him to value living moments rather than his financial gain and reassuring him that there is a free spot on her dance card for him, when he is ready. As if to reaffirm the joy of Life and faith, the choir burst into a passionate declaration with the Credo – emphasizing the directness of each declaration in Estonian “Meie Usume!”, Latin “Credo” and English “We believe”. I have used the ancient plainsong Credo from my favourite Missa de Angelis, reducing the text to the main declarations of faith. The naturally swinging compound rhythms of the plainsong are emphasized by steady semi-quaver runs on the kannel and cross-rhythm bells. With a sense of anticipation, 12. LIFE/Elu introduces our next character the 13. PROSTITUTE/Prostituut. She boasts how she is always clean and well-dressed and most of her work is not as sleazy as people think. But then she acknowledges that as her looks fade, so will her professional appeal. She maintains that we are all selling ourselves in some way – including LIFE/Elu. Her music is a little jazzy and reaches its blues zenith in 14. LIFE/Elu where we hear how underneath the PROSTITUTE/Prostituut bravado lies intense vulnerability – LIFE/Elu can hear her crying inside her house and blues music playing. Again, LIFE/Elu takes on her role of comforter and assures the PROSTITUTE/Prostituut that there is a place on the dance card for her too. This leads straight into the Sanctus & Benedictus. It starts with a lyrical sense of awe at the power and might of our holy Lord but is still initially soothing in character. The music becomes increasingly joyful and exuberant using the jaunty folk song Imed (“Wonders” from Jõelähtme, 1937 – the original text sings about finding a wondrous farm, like nowhere else in the world.) for the “Hosanna”s. I take this a step further by transforming the message into a wondrous God “Holy, holy, holy Lord” – the feeling is of overwhelming happiness, sometimes profound and sometimes playful. 15. LIFE/Elu introduces us to the 16. AD MAN/Reklaamimees. She wonders whether it is worth asking him to the dance as, like the PROSTITUTE he sacrifices his own life (and integrity) for others. She can’t decide and the music reflects this with a tremolando kannel and questioning harmonies. Little fanfares of overblown importance pepper the music for 16. AD MAN/Reklaamimees but sinister undertones appear in the double bass, which precipitate the following Agnus Dei. This part of the mass has an ostinato throughout of the lightly loping bells of Jaani Kirik (St John’s Church) (where this premiere is taking place), with a two-note pattern in which the second note is damped or muffled almost as soon as it is struck. Over this I have used the very haunting Käsikivi (The Grinding Stone, 1936), a Setu song (the polyphony and rhythms of Setu music are completely unique to this southern part of Estonia) that has a 5/8 rhythm which, with its strong beat followed by a weaker shorter one, seems to imitate the limping effect of the Jaani Kirik Bells. Over the choir asking the Lamb of God to take away our sins and have mercy on us, 17. LIFE/Elu sings of the chaotic pace of the lives we all lead and how we can only live fully when we stand still from our daily running around. She invites you, the listener, to join into the dance as the choir sing “grant us peace” and the bells of Oliviste Church, which opened this work take us immediately into…. ACT VI ~ Ita Missa est! The choir sings the opening bars of the Kyrie as we are brought back to the 18. PREACHER/Jutleja of the very beginning. He summarizes by asking how, through all the writings and advice we receive, can we find the true source of the information we need for Life. He tells us that no one knows the whole answer and that he who has the courage to ask is actually the smartest. He who has the most enquiring mind is “a true teacher”. In the final song, 19. LIFE/Elu declares that despite all our daily struggles and weaknesses, there is pleasure to be had in the Dance of Life. She reiterates her deeply proud and patriotic feelings about Tallinn (the choir accompanies her with bell-like “Tallinn”s which, as a happy coincidence, I was told sounded like the Estonian words “ta linn”, meaning “his/her town”) and leads us, with all our music of strings, Tallinn’s bells and a rejoicing choir, rising higher and higher upwards, towards God.